Joyce C. Hall, founder of Hallmark Cards, Inc., overcame poverty and a lack of a formal education to become the architect of an industry and live the American dream. Born Aug. 29, 1891, in tiny David City, Neb., Hall was the youngest son of George Nelson Hall and Nancy Dudley Houston Hall. The family was poor. His parents also were religious – a fact that led to the unlikely first name of Joyce. As he recounted in his autobiography, When You Care Enough, Hall was born on the day a Methodist bishop named Isaac W. Joyce happened to be in David City. The Hall family moved to Norfolk, Neb., before the turn of the century. Young Joyce, after an initial venture selling perfume to neighbors, clerked in his older brothers’ bookstore after school. When he was 16, Joyce and his two older brothers, Rollie and William, pooled their money and opened the Norfolk Post Card Company. But the market for imported postcards in Norfolk was limited. So in January 1910, 18-year-old Joyce dropped out of high school, crammed two shoeboxes full of postcards, and boarded a train for Kansas City, Mo. At first, he called on drugstores, bookstores and gift shops, wholesaling products created and manufactured by others. As business picked up, he ventured to the towns served by the railroads running in all directions from the Midwestern rail center. Soon brother Rollie joined him, and they opened a specialty store in downtown Kansas City, dealing in post cards, gifts, books and stationery. On Jan. 11, 1915 – five years and a day after Hall’s arrival in Kansas City – his entire inventory was wiped out by fire. The brothers floated a loan and bought an engraving firm, setting the stage for the creation of the first original Hallmark card designs. 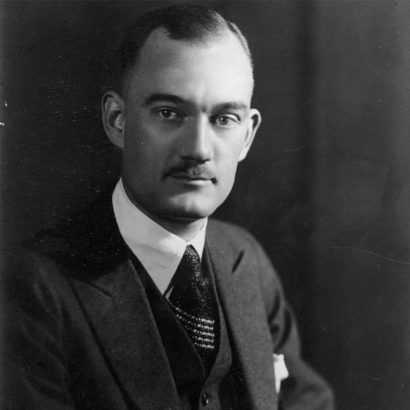 In 1921, William Hall, who had stayed in Norfolk to run the bookstore, joined Joyce and Rollie in Kansas City. In 1923, they formed Hall Brothers, Inc., the predecessor of today’s Hallmark. Hall often went against conventional wisdom. In the 1920s he wanted to replace “Hall Brothers Company” on the back of greeting cards with the phrase, “A Hallmark Card.” “Everybody in the place was against it,” he said, but he made the change. When others said advertising was a waste of money, he began creating and placing ads, and established Hallmark as the most recognizable brand name in the industry. He was warned against sponsoring a television show, but did it anyway, presenting a live Christmas-Eve production of Amahl and the Night Visitors in 1951. That broadcast launched what would become the “Hallmark Hall of Fame,” one of television’s most honored and enduring dramatic series. “Mr. J.C.” was Hallmark Cards for 56 years. Until 1966, when he stepped aside as chief executive officer in favor of his son, Donald J. Hall, no Hallmark greeting card reached the marketplace without his “O.K.J.C.” imprimatur. Never really retiring, he continued as chairman until his death, putting in a day’s work just as he had done almost every day of his life since he began selling perfume door-to-door at age 9. No longer restricted by the day-to-day responsibility of running the company, he turned his attention to the decaying urban neighborhood surrounding company headquarters. With son Donald, he decided to do something about it. Crown Center, the privately financed city-within-a-city developed by Hallmark, is the result. The bustling residential, office, hotel and entertainment district not only turned the tide of decline within its 85-acre boundaries, but also has been the catalyst for development in adjoining neighborhoods. Though he became a wealthy man, profit was never foremost in his thoughts. In his autobiography, Hall wrote: “If a man goes into business with only the idea of making a lot of money, chances are he won’t. But if he puts service and quality first, the money will take care of itself. He died Oct. 29, 1982, at the age of 91. Hall and his wife, Elizabeth, who were married in 1921, had three children: Elizabeth Ann Reid of Denton, Texas; Barbara Louise Marshall of Kansas City, Mo. ; and Donald Joyce Hall of Mission Hills, Kan., who is chairman of the company his father founded. J.C.’s grandsons now lead the company; Donald J. Hall, Jr., is CEO and David E. Hall is president. The Hall Family Foundation, a private philanthropic organization dedicated to enhancing the quality of life in greater Kansas City, was formed from the estates of Joyce and Elizabeth Hall.